In this weeks episode, Phil has a special guest. You might know him from SoonerScoop.com, but Carey Murdock joins the podcast to break down some of his favorite foods, including the infamous Taco Tico. Also, here is one of Carey's fave recipes. INGREDIENTS 1 pound large red potatoes 3/4 cup coarsely grated Gruyère (about 3 ounces) 1 large egg 1 cup milk, heated just to boiling PREPARATION Preheat oven to 400°F. and butter a 1 1/2-quart gratin or shallow baking dish. Bring a large saucepan of salted water to a boil. Peel potatoes and cut into thin slices (about 1/8-inch thick). Add potatoes to boiling water and parcook 4 minutes. Drain potatoes well in a colander. In gratin or baking dish arrange potatoes, overlapping them, in 3 layers, sprinkling first two layers each with 1/4 cup Gruyère and salt and pepper to taste. In a small bowl whisk egg and add hot milk in a stream, whisking. Season mixture with salt and pepper and pour evenly over potatoes. 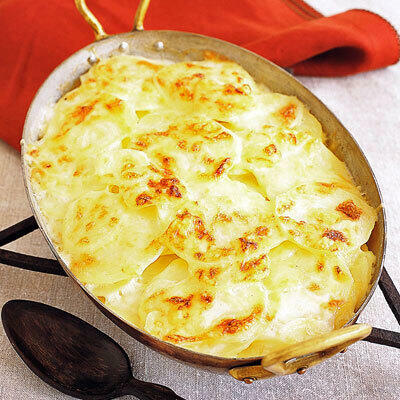 Sprinkle potatoes with remaining 1/4 cup cheese and bake 30 minutes, or until top is golden and potatoes are tender.